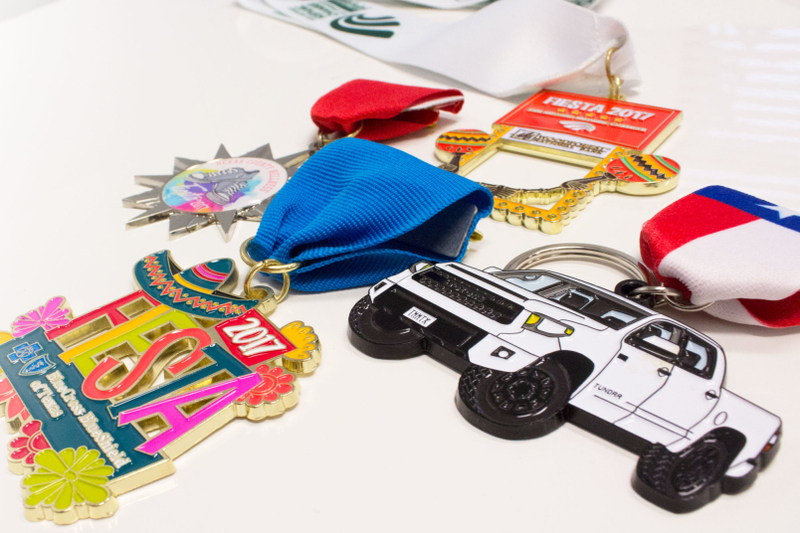 The Many Fiesta Medal Designs of 2017! A truck, a sombrero, a pair of sneakers, and some maracas. What do they all have in common? FIESTA, of course! 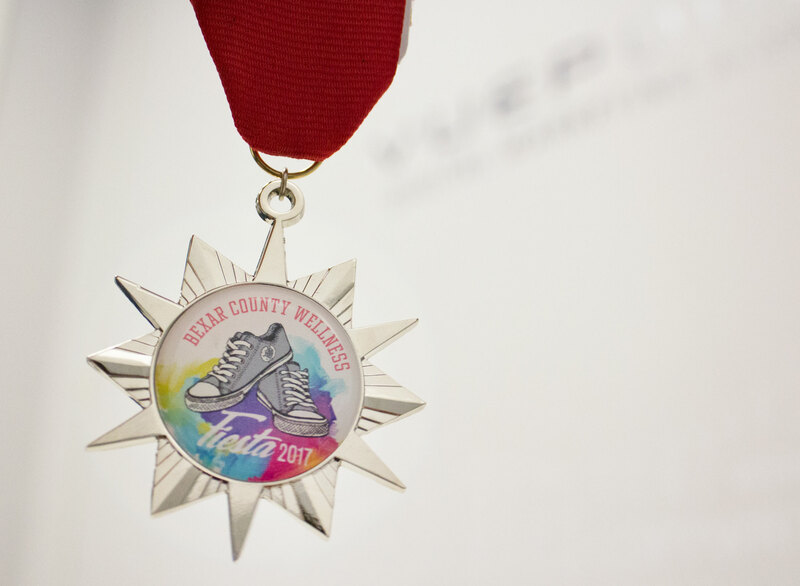 Vuepoint was busy this Fiesta season creating medals for some well-known San Antonio businesses and organizations. See how Toyota, Bexar County Wellness, the San Antonio Hispanic Chamber of Commerce, and BlueCross BlueShield of Texas got into the Fiesta spirit. For the past four years, Vuepoint has collaborated with the San Antonio Hispanic Chamber of Commerce to produce smart, unique medal designs. 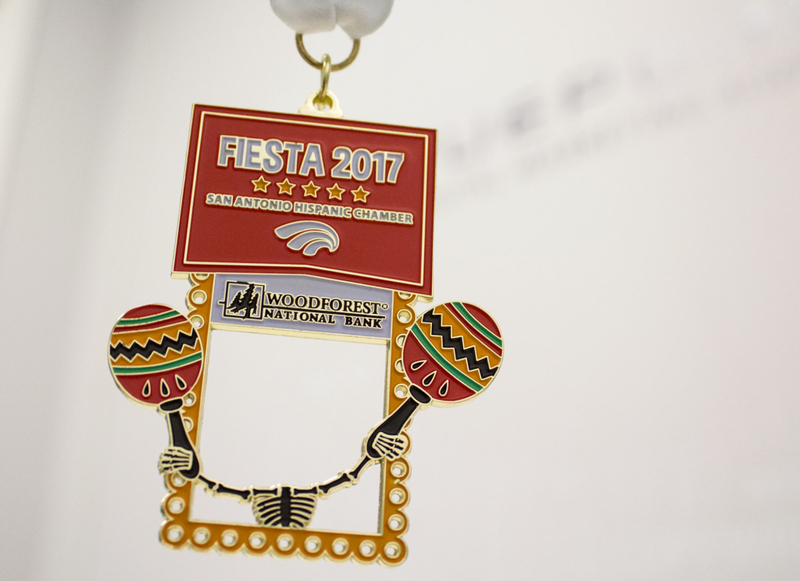 This year they wanted to keep the selfie medal tradition alive and give Fiesta fanatics another shot at owning one of these coveted medals since they sell out every year. Once again, they spurred social media engagement, and SAHCC was able to see the action through all the selfies posted. The medal was made possible thanks to its sponsor, Woodforest National Bank. Most San Antonians know that Toyota has a manufacturing plant here, but did you know that every single Toyota Tundra is built in San Antonio and NOWHERE else? 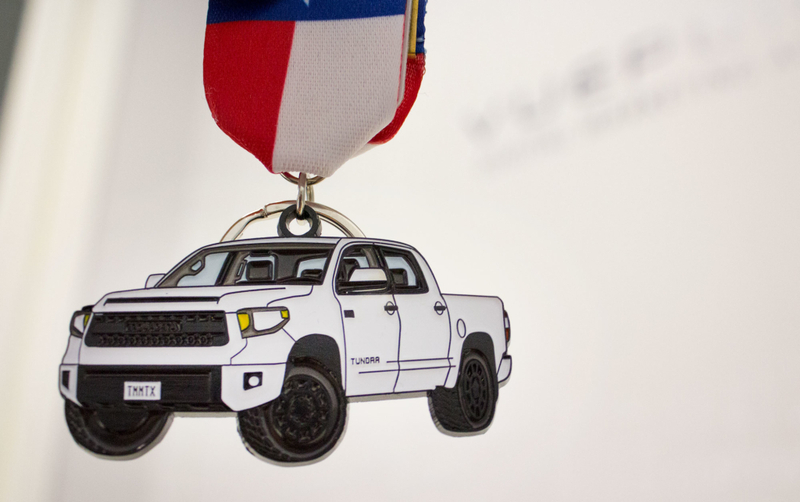 Being proud of that fact, Toyota Motor Manufacturing of Texas enlisted Vuepoint to design a Fiesta medal that celebrates their pride and joy, the 2017 Toyota Tundra TRD Pro. We used black metal, instead of the traditional gold or silver, to give the truck’s grill and tires some dimension and texture. A Texas flag themed ribbon is the finishing touch to one, classy Fiesta pin. Toyota truly values their employees, so this is just a small gesture of appreciation for them. Every Toyota plant employee will receive one of these commemorative Fiesta medals and they will not be for sale to the public. Vuepoint wanted these medals to be sported long after the Fiesta confetti has cleared, so we had a keyring attached to each piece. Presto chango! 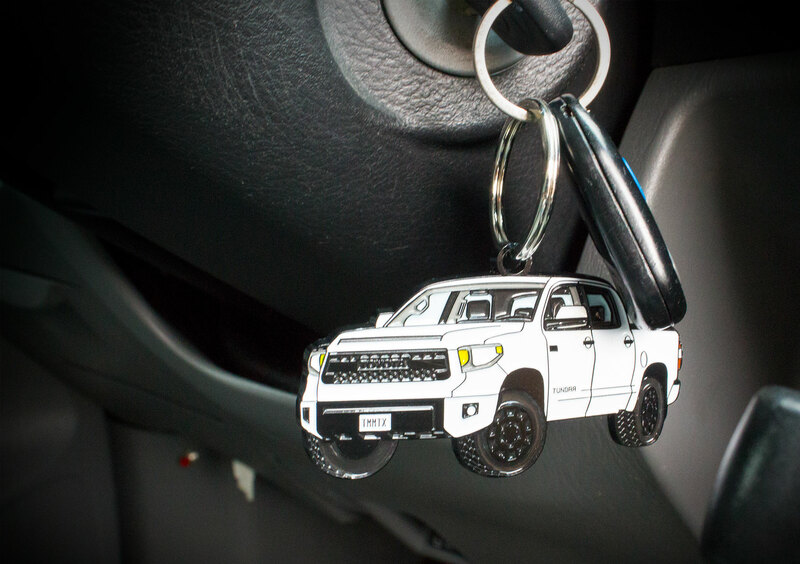 This little Tundra goes from Fiesta medal pin to a fancy new keychain. What says wellness better than a pair of sneakers? This simple but festive design allowed Bexar County Health to combine their Fiesta pride with the pride they take in their county health programs. Completely custom medals typically take several months to produce, but this medal is a great example of a quick turnaround solution. Our client was able to choose the medal shape and then insert their own custom design within. 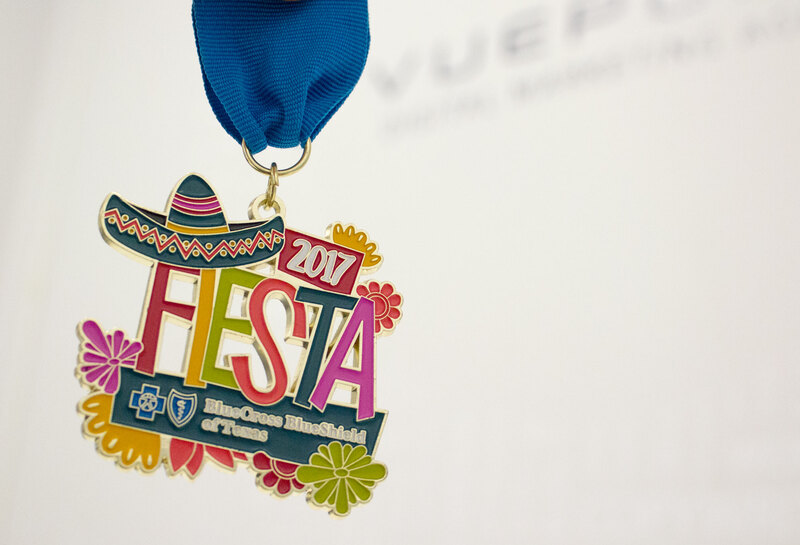 Vuepoint was proud to help BlueCross BlueShield of Texas with their simple medal design last year, but this year they wanted to up their Fiesta game with a custom medal! They were extremely happy with this super festive medal that they could share with their employees and clients. Since we’re a digital marketing agency at heart, we like to tie in digital marketing whenever we can. We love to flex our creative muscles and contribute to the spirit of Fiesta through projects like these with trusted partners like Toyota, the San Antonio Hispanic Chamber of Commerce, Bexar County, and BlueCross BlueShield. So if an original idea like a Fiesta “Selfie Medal” generates excitement and viral engagement on social media, then we’ll be sure to make it happen! We look forward to another year of continuing to work with these amazing San Antonio businesses and organizations. ¡Viva Fiesta! ¡Viva San Antonio!